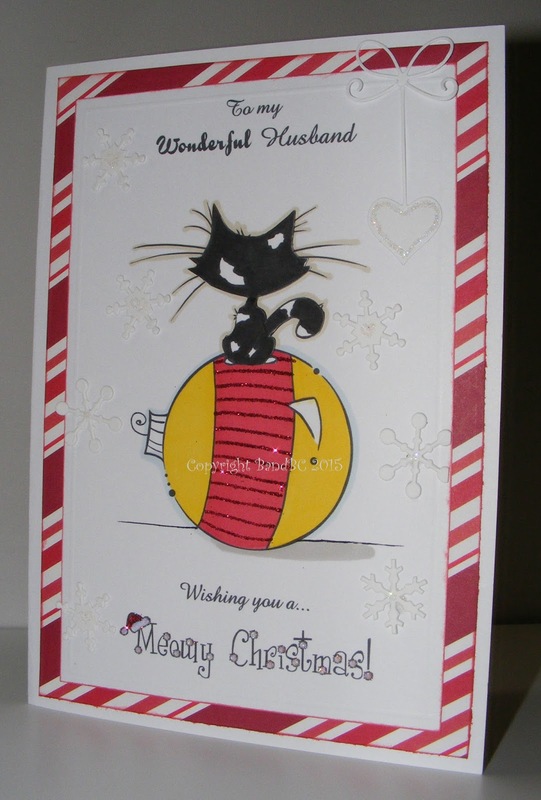 This card is based on one of our cats - Lily. jangling all the baubles as soon as our backs are turned. we didn't think she would be up to her tricks this year with the tree...she has proved us wrong! We KNOW she is feeling better for sure, now! Glittter n Sparkle - it's the "glittery, sparkly Christmas" challenge. and is called "ornament kitty"
and I coloured her to look like Lily. and then added some lines of glitter on the red stripe. with a precious heart diecut, also glittered with glamour dust. "meowy christmas" came as a freebie from desert divas. What a fun card and sounds perfect for your husband! Fabulous coloring and I love the sentiment! Thanks for joining us this week at QKR Stampede! What a super image, cats rule ok! Thanks for playing at The Male Room. LOve that cat image and your fab card, the cat reminds me of my naughty little black cat who tries hard to wreck my tree every year! Love the colour palette and design of this card. Thanks for joining us at Natalie and Amy's challenge this month.